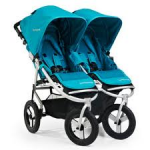 The Bumbleride Indie twin is a very stylish, smart side by side double pushchair. 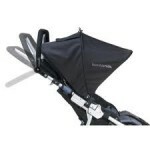 This all terrain, lightweight, narrow twin pushchair is quite brilliant to push. The Bumbleride Indie Twin is packed with features to give great comfort to the adult or the small passengers. Lift up footrests, bumper bars, large hoods, adjustable handlebar, a large shopping basket, strap recline. Very lightweight and narrow for a side by side pushchair. Air tyres. Cupholder is included. Old fashioned by good storage locks! A bit tricky to open and fold. The footrests tend to pop up when the pushchair is opened and may need putting down again. The fold is a little bulky for such a small, lightweight pushchair. No hood viewing window. Bumper bars need putting down to fold. 12" air tyres. Front wheels swivel and can be fixed. Infant headrests and shoulder pads are included. A Multi use bar (Bumper bar / car seat adaptor is included). At present it is unknown what UK car seats will fit.